(Bloomberg Opinion) -- Masayoshi Son is a very clever man. SoftBank Group Corp., his giant Japanese conglomerate, is in talks with investors to add as much as $15 billion to its Vision Fund, according to Bloomberg News. The $100 billion venture capital fund has already deployed more than $70 billion in tech companies. Son is right on the money. Even if you set aside the race to spot the next Uber-style unicorn, there are other reasons for wanting to double down on this fast-growing and lucrative part of the asset management industry. 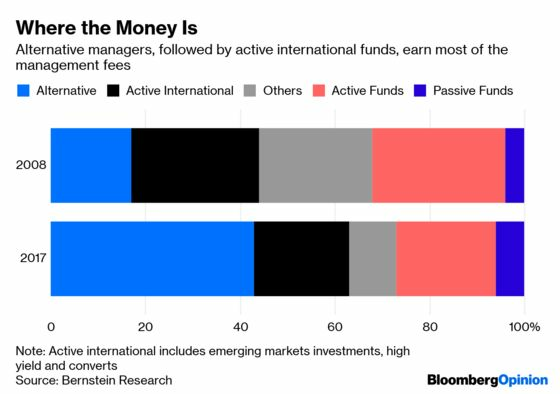 Management fees for alternative investing, where venture capital belongs, account for 43 percent of total payments for asset management services, up from only 17 percent a decade ago. The 0.7 percent to 1.3 percent range that SoftBank charges its Vision Fund investors implies that Son could net roughly $1 billion a year in fees – without needing any exits for his unicorns. That return beats what BlackRock Inc. can make from its smart beta ETFs. Son can generate the equivalent of one unicorn a year in fees by just selling himself to investors as a tech visionary. And he’ll have no trouble finding new believers. 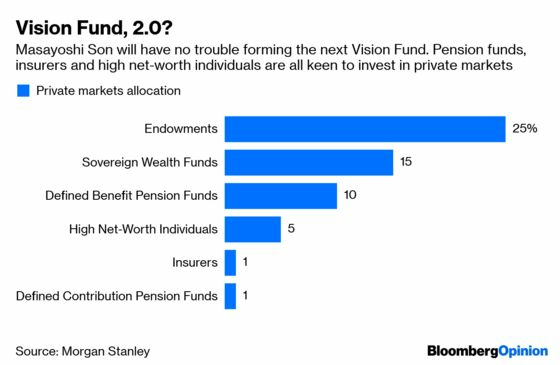 While endowments and sovereign funds are already heavily engaged in private markets, high-net-worth individuals, pension funds and insurance companies are still new to the field, and will be eager to get more involved. It makes sense for them to diversify. Still, as impressive as Son may be as a financier and money-raiser, there’s a very real danger here for SoftBank posed by the sheer scale of the investment vehicle he has created. To succeed as a public company, SoftBank needs to show that it can deliver exits for its unicorn holdings. And for that, it needs a vibrant U.S. stock market, which is the still the go-to place for large initial public offerings. 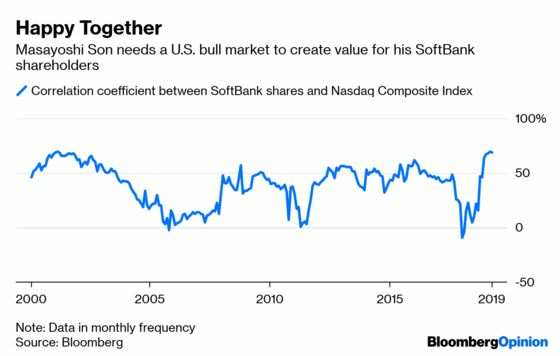 In the past year, the correlation between SoftBank’s Tokyo-listed shares and the Nasdaq Composite Index has soared to a dotcom era high, a recognition from stock investors that the company has morphed from a telecom operator to a bona fide venture capital giant. But to keep this reputation, it will eventually need some successful IPOs. And the reality is that the U.S. equity market is far less dynamic than it looks, despite the record bull run. There have been few IPOs in the country recently, while the universe of public companies has been shrinking since the late 1990s. Even the rebound this year wasn’t down to any new inflows. In the two weeks ending March 27, ETF investors redeemed $12.9 billion of their holdings. Son shares some of the guilt here. Having a $100 billion investment juggernaut investing in late-stage tech firms hugely distorts the new issue environment and clearly delays the need for unicorns to seek an IPO. A market without any IPOs eventually turns into a stagnant pond. Management fees are one thing, but nothing cements a venture capital firm’s reputation like a good exit. SoftBank’s size and success in raising funds is, perversely, one of the greatest threats to its future prosperity. Plus those buying into Son’s venture capital prowess will demand steep returns. Over the past decade, the S&P 500 Index generated an annualized 15.8 percent return, and you can access that by paying slightly less than 0.1 percent in fees for the SPDR ETF. Investors are expecting 25 percent annualized return from their alternative asset managers, according to Bernstein Research. Granted, Lyft Inc.’s IPO bodes well for new issues overall. But what Son’s investors will remember is that Carl Icahn managed to offload his Lyft stake at roughly 10 times what he paid for it. The watermark is high for Son’s own investments.